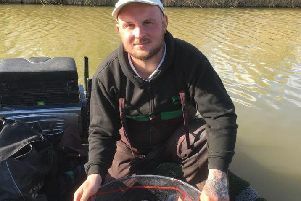 Graham Welton was runner-up in the Angling Trust Winter League final. Saturday saw the final of the Angling Trust Winter League fished on our fenland drains and the Decoy Lakes complex with teams from all over the country taking part. All had to qualify through a six-match league with many then having to travel hundreds of miles to compete in what is still regarded as one of the best team events in the country. Rob Hewison was fourth on Fenland Drains. Despite some harsh critisism from a few anglers, both venues performed reasonably well considering the conditions that descend on the country. The match coincided with the return of winter in the form of heavy frosts and a bitterly cold easterly wind blowing across the fens, a sure recipe for disaster. Thankfully it was no where near as bad as many had predicted. Yes, weights were well below par but for a huge winter match fished in freezing, bright, sunny conditions I think the venues held up quite well. Everone knew the draw would play a huge part in the day’s proceedings, as it does in most matches and especially team events. There are always going to be good, bad and indifferent draws, that’s part of match fishing. And that is especially true at Decoy Lakes as the fish did shoal up, making for a great day’s sport for some while others just a few pegs away struggled for a bite. But that is winter fishing, even in much better conditions that still happens. The match was split into two equal halves. On the fenland drains some were greeted with thin ice at their pegs but most had cleared by the start of the match. As expected the March Twenty Foot produced some good nets of roach, the Old Nene was consistent if not spectacular and both Factory Bank and the Old Nene at Benwick also saw weights being taken. It was Decoy Lakes where the big nets of fish came from though. The overall matchwinner Tony Dyson put a huge 105.15kg to the scales to comfortably win the event, while on the drains Tom Morretti came first with 11.97kg. We did have a couple of locals in the main frame. Graham Welton was runner-up from Decoy with 64.45kg while over on the drains Rob Hewison put 8.76kg to the scales to take fourth place. The all important team result saw our two local teams have very different results. Stanjay Gold came a very creditable fourth, a really good result against the best in the country. Unfortunately Browning Hotrods, who many had tipped to make the top five at the very least, came well down the leaderboard in 21st position. Team Result: 1 Maver North West 51ts; 2 Drennan Barnsley 57pts; 3 Sensas Starlets 73pts; 4 Stanjay Gold 74pts (111.16kg); 5 Sensas North West 74pts; 6 Preston Innovation Thatchers 74pts. Individual Result: Decoy Lakes - 1 A. Dyson (Elm 16) 105.15kg; 2 G. Welton 64.45kg; 3 D. Ashington 64.30kg; 4 T. Watson, 41.15kg; 5 P. Archer,36.25kg. Fenland Drains - 1 T. Morretti (March) 11.97kg; 2 W. Freeman (March) 10.26kg; 3 B. Wilks (March) 9.64kg; 4 R. Hewison (Benwick) 8.76kg; 5 P. Cannon, 8.72kg.